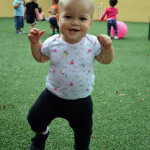 Are you looking for the perfect Coral Springs Infant Daycare? The Infant Daycare center at Andy Bear ELC in Coral Springs, Florida has been specifically designed for the comfort and safety of the infants in our care. We offer two levels of infant care — 6 weeks through 10 months and 10 months through 18 months. All toys and surfaces are disinfected and sanitized daily. Our infant care staff is trained to use hospital standards in sterilization and decontamination during and after diaper changes. We provide a safe, clean, and nurturing space for infants to use their muscles and develop their motor skills. Supervised crawl time, peek-a-boo, and observed playtime, allow infants to grow, while developing coordination and social skills that will serve as the foundation for later developmental milestones. We provide age-appropriate toys to allow infants to explore their space, and alter their environment in a safe way, with the careful guidance of experienced and nurturing caregivers. Infants are taken outside twice daily weather permitting, in our two seater and six seater strollers. With proper supervision, modeling of proper play, and a safe environment, infants can learn to develop key motor skills, and trust in adults and other children. We help even the youngest children find the confidence to explore and grow. Playtime includes the use of age appropriate books and play spaces. Because newborns and infants still have developing immune systems, we understand the importance of a clean and sanitized play environment. Andy Bear Early Learning Center, is a preschool in Coral Springs/Parkland, Florida that has a full-time housekeeping staff to ensure that infants are in a healthy, clean and well-maintained environment. Marcia, the Owner and Director of Andy Bear Early Learning Center, supervises the day to day activities and ongoing training. Marcia holds an MBA and Bachelor’s Degree in Business Administration, as well as a degree in Nursing. She also has over 20 years of experience as a hospital trained Maternity and Neonatal Nurse and is also certified in CPR and First Aid. Our Infant Daycare Center in Coral Springs provides a nurturing atmosphere where your baby can flourish and satisfy their curiosity in a safe environment. Our infant caregivers are not only skilled in child development principles, but are also trained to help your baby explore their environment and develop fine motor and communication skills. These skills are vital to the healthy development of your child in their first year. At Andy Bear ELC we are doing much more than providing Infant Daycare, we engage with your baby in order to promote and cultivate cognitive and social skills to prepare them for the next level of their education. Our personalized care for each infant allows us to work with each child’s unique feeding schedule, nutritional requirements and we are always available to discuss any special instructions with parents. We are here to support our parents and work with them to ensure that we are providing everything your baby needs to be successful, happy, safe and secure when they are in our care. Infancy is a critical time in every child’s life. Babies have special needs and require more focused attention than older children. Close attachment with caregivers fosters emotional and even physical growth in infants and very young children. At Andy Bear Early Learning Center, our team of childcare experts and staff understands that the first months of life are paramount for a child’s cognitive, physical, and emotional development. We pride ourselves in understanding infants’ unique needs. The sensorimotor stage lasts from birth to around 24 months. Albert Michotte performed studies that suggest that infants have a sense of cause and effect. Babies are able to understand that their actions can have an effect on the environment. An important milestone during the sensorimotor stage is the development of the concept of object permanence. When babies are first born, they do not always understand that objects that are not present still exist. For instance, if an adult hides a toy behind a screen, a very young infant may not understand that the toy still exists, but just remains hidden behind the screen. As babies grow and develop, they begin to understand that objects still exist even when they are gone. Infants acquire object permanence by nine months of age. As a result, babies won’t always cry when they are away from their mothers when they are very young. However, as infants grow, they may develop a clearer sense of absence. For this reason, it is important that infants receive consistent and constant nurturing from all care givers. 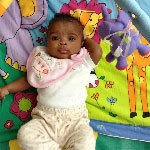 At Andy Bear Early Learning Center, we understand that infants have unique developmental needs. For this reason, we offer nurturing care to meet these unique needs. Infants must also learn depth perception. For example, in certain cultures people cannot see for long distances due to close confines or dense foliage. When these people are placed in open prairies, they might believe that the distant elephants they see are ants or some other small insect! When babies are placed in rooms where they must gauge distances, they grow to understand that things placed further away from them will appear smaller and that things placed closer to them appear larger. Self-awareness, or the ability to identify oneself in a mirror, is another important developmental stage. This usually takes place between 15 and 24 months of age. Andy Bear Early Learning Center is an infant care center in Coral Springs/Parkland, Florida. We are devoted to ensuring that children reach these key milestones.